I'm pleased to be here at the StartmeupHK Venture Forum, among the highlights of this year's StartmeupHK Festival. Designed to inspire innovation, boost your business intelligence and contacts, perhaps even move your shiny start-up a few million dollars closer to the billion-dollar unicorn jackpot. Later this afternoon, a panel discussion will tell you how to reach unicorn valuation - that loftiest of start-up capital summits. And why not? In the words of one company president turned country president, "As long as you're going to be thinking anyway, think big." Today's forum is flush with big thinkers and outsized success. So, too, is the setting of today's forum. Yes, Hong Kong has long enjoyed success on a global scale, rising and reinventing itself continuously over the years and decades - from a manufacturer and exporter to an economy built on financial services and capital and the world-class professional services that help power it. In order to sustain our competitiveness in the 21st century, we need a new engine for our economy, in the form of innovation and technology (I&T). Taking into consideration Hong Kong's strengths and capabilities, we will be focusing on four areas - artificial intelligence and big data analytics, biomedicine, smart city, and Fintech. We are also working relentlessly with industry stakeholders to further enhance Hong Kong's ecosystem for start-ups. After all, this is a city shot through with entrepreneurial spirit and the resilience it demands. Today, a new generation of disruptors is taking advantage of Hong Kong's favourable economic and cultural environment to create, innovate and enable tomorrow's economy. In recent years, our start-up scene has also taken off - not surprising, of course. According to San Francisco-based research firm Compass, Hong Kong is among the world's five fastest-growing start-up centres and one of the world's top 25 start-up hubs. Results of InvestHK's latest Startup Profiling Survey show a 16 per cent increase in start-ups this past year, to 2 300, and a 21 per cent gain in start-up jobs, to more than 6 300. The survey also shows a growing number of overseas founders. They chose Hong Kong because of our unique advantages afforded by the "one country, two systems" arrangement, our prime location, our low and simple tax system, our rule of law, our world class financial and professional services, and of course, much more. These young, talented entrepreneurs also bring with them international experience and perspective. And that can only make our start-up community truly reflective of the dynamism and multiculturalism of Hong Kong - Asia's world city. The HKSAR Government is committed to the development of innovation and technology. We have allocated more than US$3.6 billion into different programmes and initiatives since 2015, to further enhance our technology infrastructure, to encourage SMEs to make wider use of technology, to promote mid-stream research and development, to further improve our ecosystem for start-ups through venture capital funding and incubation programmes, and, last but not least, to nurture and attract talent of the right calibre to support innovation and technology development. One key initiative to support start-ups is the Innovation and Technology Venture Fund. Some US$256 million has been set aside to invest in local I&T start-ups, working with select private-venture capital funds in an investment ratio of 1:2. Our Public Sector Trial Scheme provides support of up to US$130,000 a project to start-ups for research and development trials in the public sector. The programme has been extended to cover companies in the Hong Kong Science Park and Cyberport, Hong Kong Government’s key partners in the development of I&T. The Internship Programme has also been expanded to include incubatees and SMEs at Science Park and Cyberport. Each company can recruit up to two local university graduates as interns for up to two years. Recently, Cyberport set up an Investor Network to attract venture capitalists, angel investors and private equity funds from around the world. The Network's goal is clear: to enhance the fund-raising and deal-making capabilities of Cyberport start-ups. Science Park, which offers incubation programmes in new technology, biomedical technology and web and mobile technology, has set up a US$6.4 million Corporate Venture Fund. The Fund will partner with angel investors and venture capital (VC) funds to invest in start-ups that are either based at Science Park or have participated in its incubation programmes. With a growing number of private VC funds attracted by Hong Kong’s start-ups, as well as incubators, accelerators and co-working spaces now operating in Hong Kong, I am confident that the start-ups scene in Hong Kong will continue to flourish. Down the technology road, we can look forward to the development of the Guangdong-Hong Kong-Macao Bay Area, a national development plan covering Hong Kong, Macao and nine cities in Guangdong Province including Shenzhen, Guangzhou and Zhuhai. With a total population of more than 68 million and an aggregate GDP of more than US$1.4 trillion, the Bay Area compares favourably with Australia or the Republic of Korea. Amongst other things, Bay Area development will bring exceptional opportunities for Hong Kong to join hands with Shenzhen and other Bay Area cities to develop an international innovation and technology centre very much like the Silicon Valley. It will also allow innovative start-ups based in Hong Kong to tap into the region's skilled technical talent pool, its rapid prototyping and advanced manufacturing capabilities, as well as its just-in-time fulfilment and logistics strengths. One highlight is the Hong Kong-Shenzhen Innovation and Technology Park, with a total floor area of about 1.2 million square metres. Located just below the boundary with Shenzhen, the Park will rise as an international centre for innovation and technology research, creating huge opportunities for the Bay Area, for Hong Kong companies, and, of course, for the companies that partner with us. The HKSAR Government has just released last month our blueprint for smart city development. You can hear more about our smart-city plans at tomorrow's Connected City event. These include a regulatory sandbox involving not just the Hong Kong Monetary Authority, but also the Securities and Futures Commission and the Insurance Authority. They will be linked together, creating a single point of entry for cross-sector Fintech pilot trials. You can learn more at Fintech Finals, another StartmeupHK Festival feature, tomorrow and Wednesday. Ladies and gentlemen, in just two weeks, we will celebrate the Lunar New Year - the Year of the Dog. Now I'm not going to suggest that dogs top the innovation list when it comes to domestic animals. But the dog is an enduring symbol of loyalty and honesty. And any owner will tell you that dogs are smart, curious and blessed with a welcome sense of responsibility. In short, I see a great year ahead for start-ups. 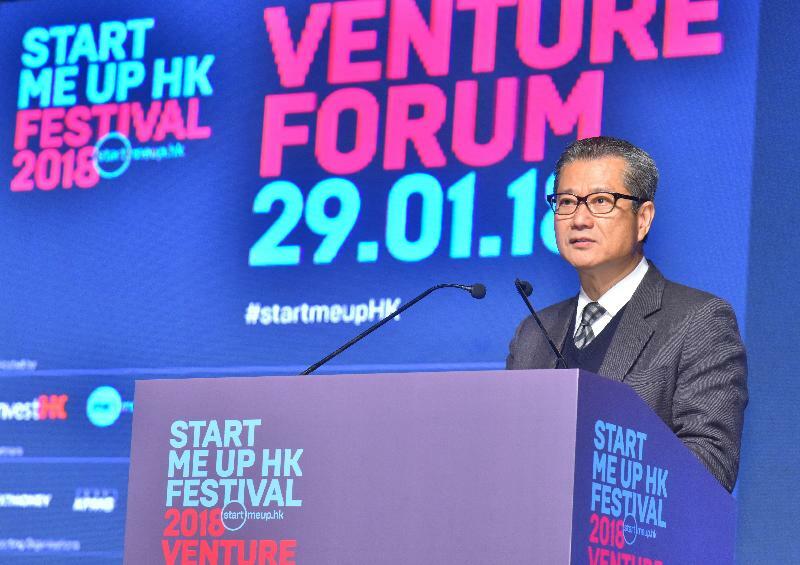 I wish you all a rewarding forum, the best of business at the StartmeupHK Festival, and a happy and healthy New Year.